We have added a Facebook 'Like' badge that links to our Facebook page. If you have a facebook account, you can click the 'thumbs up' graphic to add it to your list of 'liked pages'. We need at least 25 people to 'Like' our Facebook page so we can apply for a shortened website link. In addition, you'll find a set of links to my 'Optimistgord' blog where I publish computer tips for volunteers. Two important changes have been made. The 'News' page now displays a summary of each new article posted on our District Optinews blog. In addition, a link to the latest Optinews blog articles will appear on the District website 'Home' page. 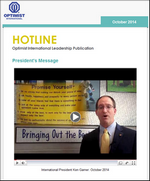 Anytime a new article is posted to our District Optinews blog, it will automatically update our District website. I have also linked out Optinews blog to our District Facebook page. When a new article is posted on our blog, it will also appear on the 'Wall' on our Facebook page. I plan to open a twitter account that will also be updated when a new article is posted to the District Optinews blog. In addition, we will be adding the ability to store powerpoint slideshow presentations online, so everyone will be able to see some of the presentations after each District quarterly meeting. If you have any other suggestions, please email me your ideas. Each year every Club can choose to recognize a deserving club member by nominating them for an OI President's Citation. There is always a member in your club that put's in a little extra to make sure you club fund raisers work and community service projects are successful. 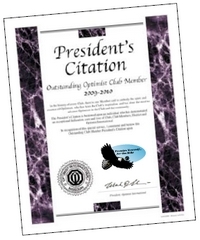 An OI President's Citation is unique to each year, carrying the President's logo and signature and serves as a permanent momento of the appreciation that both OI President Mark and a club bestows on a deserving member. To nominate someone, the Club President needs to fax or mail the nomination form the applicable US or Canadian OI Office. The deadline date is August 31, 2010. We suggest that you set August 15th as your deadline and call the applicable OI Office to make sure they received your completed nomination form. We want to welcome our newest Optimist club to the District, the Penhold & District Optimist Club organized on June 23, 2010 in the city of Penhold, AB. The organization meeting was officiated by our newest OI Field Rep, Duane Kelly. The Penhold & District Optimist Club, was formed to service the needs of the youth in Penhold and area as per the motto of Optimist International, ‘Friend of Youth’. While organized on June 23, 2010, the Penhold and District Optimist Club will be conducting a wide variety of activities to benefit the youth and community. On behalf of Zone 3 (Gov Darryl's home zone), we would like to welcome our newest club, organized with 32 enthusiastic charter members. Their first project is already planned for July 10. They will be volunteering at Penhold’s Grand Opening of their newly built Multiplex. I know that everyone will do all we can to assist them! Officers and board members of the Penhold and District Optimist Club will be installed officially at their charter event by Governor Darryl Sim and we will keep you apprised as to when the date will be. Thanks to Duane Kelly (District Leadership Chair), Governor Darryl Sim, Guy Gibson (Past Governor) and Lt Governor Laura Murphy. The new Optimist Club is sponsored by the Red Deer Optimist Club and the Waskasoo Optimist Club of Red Deer. 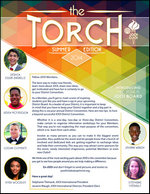 The July edition of our District Newsletter is now available for download. You'll find eleven pages packed with information including an update from Gov Darryl, congratulations to Opt Duane Kelly, and info about "Kids in Motion" from the Calgary Dinner Optimist Club. Junior Golf Chair Mike DeNicola is providing all of the information for Junior Golf competitions throughout the District. From Blackfalds comes a story about the "Blackfalds Run and Walk". Read about the 50th Anniversary recently celebrated by the Red Deer Optimist Club. Sad news from St. Albert and Regina as we say farewell to Marion Kreller and Alex Wilson. Supplies Chair Brian Wallace is promoting the new Corall website and he provides some info about supplies for the District Convention. There is some news about a workshop at the International Convention and a story about the Charter Banquet for our newest club, the East Central Alberta Optimist Club in Wainwright, AB. Opt Ken Williamson closes with a few words from the "Editor's Corner".